The hottest new book is available now! 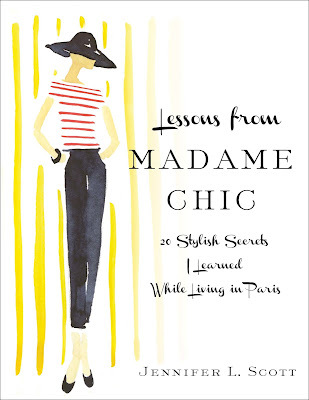 “Lessons From Madame Chic: The Top 20 Things I Learned While Living in Paris.” By Jennifer L. Scott. When Jennifer Scott arrived in Paris as a foreign exchange student from Santa Monica, California, she had no idea her life would be fashionably transformed. The lady she was staying with (AKA Madame Chic), took Jennifer under her wing and became her mentor. The book tells of life lessons that she gained while living in France. From how to look polished by getting rid of 70% of her “throw-away” wardrobe to healthier, glowing skin by eating with a fork and knife. The author admits that “You must suffer to be French” but also how these lessons have changed her for the good. Please come to my store, Roadkill Ranch & Boutique, for a book signing event. We’ll bring the refreshments, you bring the advice!